Iskandar Ehet, Hasayn Muhammad and Turgun Tohtunyaz were convicted of premeditated murder and leading a terrorist group in September 2014. Their guilty verdicts and sentences were recently upheld by China’s highest judiciary, the Supreme People’s Court, clearing the way for the executions. The three men did not physically participate in the shocking March 1, 2014 attack in Yunnan’s provincial capital. Instead, according to the now-accepted narrative, they were apprehended for illegally trying to cross the border out of China two days before the train station rampage. In a statement made shortly after the attack, then Yunnan Party Secretary, Qin Guangrong,characterized the captured men as Muslim terrorists, adding one had confessed to his crimes and admitted the group wanted “to join jihad”. Parts of this narrative directly contradict previous press accounts claiming the suspects were captured following a 36-hour manhunt in Kunming undertaken by authorities after the train station bloodshed. It remains unclear when or where the men were actually caught, as no details of their arrests have ever been made public. Alternately dubbed the ‘3.01 Event’ and ‘China’s 9/11’, the March 2014 attack left 31 people dead and 141 injured. Four of the assailants were shot and killed at the scene — in some accounts by a single police sniper in under 15 seconds. The lone female attacker, Patigul Tohti, was apprehended alive at the train station and later sentenced to life in prison at the same trial where Ehet, Muhammad and Tohtunyaz were condemned to die. Making an already painful and opaque situation even more confusing, investigators who claimed the case was closed in mid-2014, announced last month that four new suspects had been arrested in Indonesia. Another five people thought to have helped orchestrate the Kunming plot reportedly escaped a police dragnet by Indonesian police. Uncertainty of details aside, this week’s handling of the executions was far more subdued than the last time Kunming authorities dealt with a high-profile death sentence. The simple announcement was made on a micro-blogging service and did not mention the means of death or where the executions were carried out. 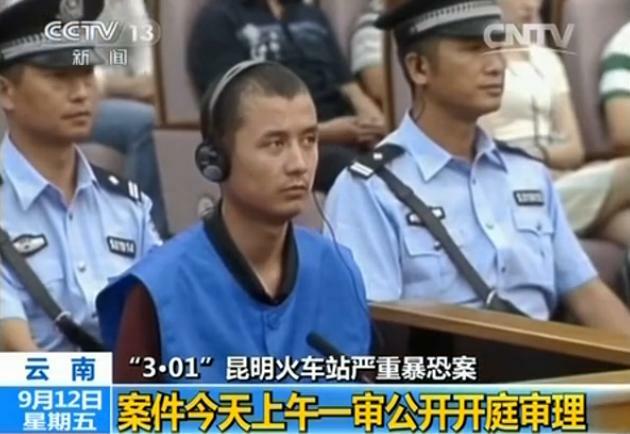 In stark contrast, Kunming judicial officials made waves both inside and outside China in 2013 for their handling of the execution of Burmese drug kingpin and convicted murderer Naw Kham. Authorities televised his final hours, producing an ill-conceived reality television show — complete with running commentary — that aired nationally. It ran for nearly two hours, ending with a live interview with Naw seconds before he was taken away and killed. The Intermediate Court of Kunming has found four defendants guilty of carrying out a deadly knife attack that claimed the lives of 31 civilians and injured 141 in March of this year. Three of the defendants, all men, received the death penalty, while the lone female suspect was sentenced to life in prison. The one-day trail, held on September 12, lasted only a few hours. Video shows the three men, Iskandar Ehet, Turgun Tohtunyaz and Hasayn Muhammad seated in court with shaved heads, wearing matching blue prison uniforms. They were all found guilty of “premeditated murder and leading and organizing a terrorist group”. The fourth defendant, Patigul Tohti, will spend the rest of her life behind bars after being found guilty of “intentional homicide and joining a terrorist group”. None of the men on trial participated directly in the train station attack, according to a BBCreport. Instead, they coordinated the assault from afar — making plans beforehand and then directing five of their associates. Court documents made public following the trial say the three men were all captured by police two days before the attacks occurred. This narrative directly contradicts previous official accounts claiming the suspects were apprehended March 4 following a 36-hour manhunt in Kunming and beyond. It remains unclear when or where the men were actually captured, as no details of their arrests have ever been made public. Conversely, the story surrounding female assailant Tohti has remained consistent since March. She was arrested following a bloody rampage wherein she and four others indiscriminately stabbed dozens of people who were queueing to buy tickets at the Kunming Train Station. Tohti was eventually subdued by police and arrested, while her four co-conspirators were all reportedly shot dead in a span of 15 seconds by a SWAT team sniper. The trial in Kunming was uncharacteristically open to the public, and 300 people, including victims and their families, attended the proceedings. Security at the courthouse was increased noticeably, with armed guards posted both inside and outside the courtroom. China has significantly ramped up law enforcement and ‘anti-terror’ efforts following the bloodshed in Kunming. In many cities around the country, police officers are now permitted to carry sidearms for the first time in decades. Trials involving suspected militants have also increased, and hundreds of people have been jailed for terrorism-related crimes by Xinjiang police as violence escalated over the summer. This article was written by Patrick Scally and originally published on GoKunming. In March of this year, a group of men and women armed with knives descended on the crowded Kunming Railway Station. Their ensuing rampage left 29 civilians dead and 143 injured in what is one of the most violent coordinated attacks to occur in China in recent memory. Four people accused of perpetrating the violence have been formally charged and will soon stand trial, Xinhuais reporting. Official accounts of the attack state that six men and two women participated in the train station assault. Of those, four were shot and killed at the scene by police. One woman was subdued and arrested at the station, while three other suspects remained at large for 36 hours before being captured. No details of the manhunt or exactly how, where and when the fugitives were caught have ever been made public. The four defendants stand accused of multiple crimes and will presumably face the death penalty if convicted. 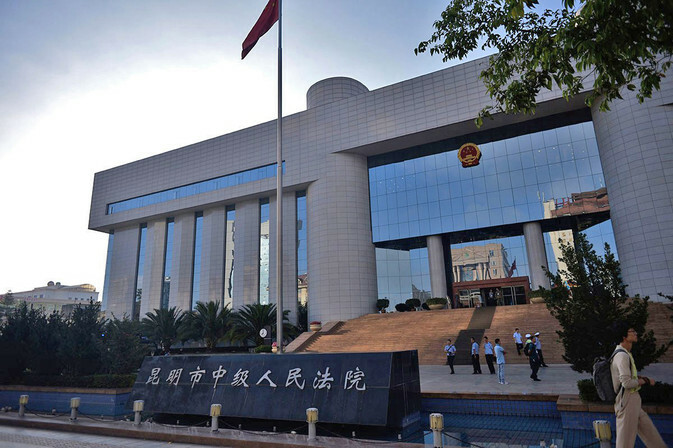 They have each been charged by the Kunming People’s Procuratorate, the city’s highest court, with participating in a terrorist organization, carrying out violent terrorist activities and premeditated homicide. No date has been publicly announced for a trial. The defendants are all ethnic Uighurs from China’s Xinjiang Autonomous Region and prosecutors maintain the March 1 attack was religiously and politically motivated. In a statement made shortly after the suspects were apprehended, Yunnan Party Secretary, Qin Guangrong,characterized the captured men and woman as Muslim terrorists, adding one had confessed to the crime and admitted the group wanted “to join jihad”. China has significantly ramped up law enforcement and ‘anti-terror’ efforts following the bloodshed in Kunming. In many cities around the country, police officers are now permitted to carry sidearms for the first time in decades. Trials involving suspected militants have also increased, and 113 people were recently jailed for terrorism-related crimes by Xinjiang courts. Click here to link to this article written by Patrick Scally, first published on July, 1 on the GoKunming website. In the wake of the Kunming massacre, the mood in Beijing is more choleric than somber. President Xi Jinping immediately announced a nationwide crackdown on terrorism and military troops were rapidly posted at train and bus stations throughout the country. Armored vehicles now patrol Kunming, Xinjiang natives have been told to register themselves at local police stations in Qinghai province and in Guangxi province authorities have asked citizens to report if they see anyone from Xinjiang — anyone at all. President Xi also issued a gag order on local reporting, with coverage in Kunming Daily and Yunnan Daily provided by Xinhua reporters in Beijing. Meanwhile China Daily featured a front page photograph of President Xi shaking hands with an ethnic Uighur member of the PCC (China’s Senate). But strengthening national unity goes beyond public cries for concord and front page handshakes. It also involves eliminating the perceived cause of the conflict, and the national narrative is that this cause has more to do with nomadism or Islamist ideology than the fact that employment opportunities for Uighur people, even in their homeland province, are dismally inadequate. In 2009 Ilham Tohti, economics professor at Beijing’s Central Nationalities University and an ethnic Uighur, spoke with Radio Free Asia and suggested jobs might be the key to settling unrest. But rather than address economic pressures, the government continues to focus on Islam as the catalyst. In 2013 police in Xinjiang began harassing women in head scarves and men with beards. Radio Free Asia reported how one man, with no prior record of violence, stabbed a police officer when he was forced to shave. Ehmetjan Niyaz, an intelligence agent with the local security bureau, commented that they had been advised to investigate men with beards. In Xinjiang, that essentially means all Uighur men. In other words, the more Beijing singles out Muslims as a means of burking separatism, the more separatist Xinjiang Muslims become. Gardner Bovingdon, Professor of Central Eurasian Studies at Indiana University and author of The Uyghurs: Strangers in Their Own Land, writes “the closure of mosques, supervision and dismissal of clerics, and the prevention of religious practice by the young — has made Islam in Xinjiang more rather than less political”. Another government strategy has been to manipulate the demographics of the region. Of the 60% of Xinjiang’s population that is not Uighur, Kazakhs constitute 7% with Hui being another 4.5%. The remaining dozen or so minority groups collectively make up 8.5% while the final 40% is entirely ethnic Han. According to Dr Stanley Toops of Miami University, from 1953 to 1964 the presence of ethnic Han rose from 7% to 33%. Since the 1970s, this number has remained stable at around 40%, making it one of the fastest demographic shifts in Chinese history. Morris Rossabi, who teaches History at Columbia University, points to the Tang Dynasty as the origin of the bingtuan. Famously cosmopolitan, the Tang Dynasty celebrated the Turkic culture of present-day Xinjiang, staffing its frontier armies with Turkic soldiers and even allowing some, like the great Ashina Se’er, to rise to the rank of Tang general. This helped frontier lands become self-reliant and even afforded some measure of political autonomy. The bingtuan follows this tradition by providing Xinjiang the means for economic self-reliance, yet deviates sharply by staffing its workforce with ethnic Han rather than local Uighurs. With Xinjiang currently contributing roughly 4% of the nation’s GDP (primarily through oil reserves) as well as Beijing’s Western Development policy, which hopes to see China’s western provinces contribute greatly to the nation’s economy, Uighurs will remain a minority in Xinjiang for the foreseeable future. Dr Ilham Tohti has stated he is not opposed to state-orchestrated migration policies, but that these policies need to be carefully reviewed, pointing that if there are enough jobs to warrant the migration of millions of ethnic Han into the region, then why aren’t there enough jobs for the people already living there? In 2006 Dr Tohti launched a website promoting understanding between ethnic Han and Uighurs, but in 2009 it was shut down and Dr Tohti was arrested. He was released shortly before President Obama’s visit to Beijing but in January 2014 the BBC reported he had again disappeared, that his family had no knowledge of his whereabouts and that the government was charging him with separatism — a crime punishable by death. For now, events like the Kunming massacre serve to further Beijing’s program of economic development in Xinjiang by providing carte blanche to those who view ethnic identity as a major roadblock to China’s economic future and by giving Xinjiang politicians an easy scapegoat when they fail to provide economic paths of opportunity. ‘Uighur’ Refugees Arrested in Thailand, Malaysia: Part of a Larger Trend? Last week, East by Southeast, in a piece hypothesizing the motives of the Kunming train station attackers, made the connection between Uighur asylum seekers, Yunnan and Southeast Asia. In the analysis, ExSE posited that Thailand was a likely destination for Uighur refugees as they made their way from Xinjiang, through Yunnan and into Myanmar or Laos. This past week, two separate incidents in near the border of Thailand and Malaysia occurred that appear to confirm this hypothesis. News was released on Thursday that Thai authorities had rescued 200 people from a human smuggling camp in the south of Thailand. During a raid on Wednesday, police discovered 200 people imprisoned in a camp suspected to be used for human trafficking. The group, which includes 78 men, 60 women and 82 children, at first claimed to be Turkish, despite having no documents to confirm that. However, they have now been identified as ethnic Uighurs from China by a US-based organization. With their identities confirmed, Thailand has faced calls to not to deport the refugees, with the US State Department also weighing in. Despite these calls, dozens of the refugees were sentenced for illegal entry by a Thai court on Saturday, with each person assessed a fine of 4,000 baht ($124). For now, the men will be taken to an immigration detention center and the women and children will be taken to a shelter, according to Police Major General Thatchai Pitaneelaboot. In a possibly related story, 62 people were arrested just across the border in Malaysia last week. Like the group caught in Thailand, the Malaysian also claimed to be Turkish refugees. The group of alleged Turks were found near the border fence during routine patrols early Thursday morning Deputy Superintendent Sivam of Malaysia’s General Operations Force said in a statement. Despite their claims of Turkish nationality, those arrested were not carrying valid travel documents or identification papers and historically, there has been a small, if nonexistent presence of illegal Turkish immigrants in the region. In light of this and the arrests in Thailand, some in the media believe that the alleged Turks might in fact be Uighurs from China. If so, this would mark the largest number found in Southeast Asia to date. If both groups arrested are indeed Uighur refugees, their escape to Southeast Asia wouldn’t be without precedent. Since Cambodia deported 20 Uighurs back to China in 2009, there have been a string of similar deportations in the region. In 2010, Lao PDR deported a group of seven Uighur refugees back to their native Xinjiang in northwest China and in 2011 and 2012, Malaysia deported separate groups of refugees to China. Each deportation case has been heavily criticized by rights groups like Amnesty International and Human Rights Watch. Human rights groups fear that once repatriated, Uighurs face a grim future of long prison sentences and possible torture. Refugees deported back to China from places like Pakistan and Cambodia have all faced life prison terms upon their return. The threat of prison is likely a reason why those arrested in Thailand and Malaysia have claimed to be Turks when discovered. Instead of admitting to Chinese nationality and facing the possibility of deportation back to China and likely prison time, the refugees opted for claiming another nationality. Seeing that the Uighur population is nearly all Muslim and speaks a Turkic language, claiming Turkish citizenship was a natural choice. However, as is the case with both groups of refugees, these people’s true identities have yet to be discovered. If they aren’t Turks, are they really Uighurs? 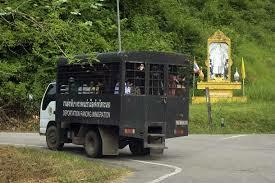 If they are Uighurs, how did they get to the Thai-Malaysian border and why did they come this far? 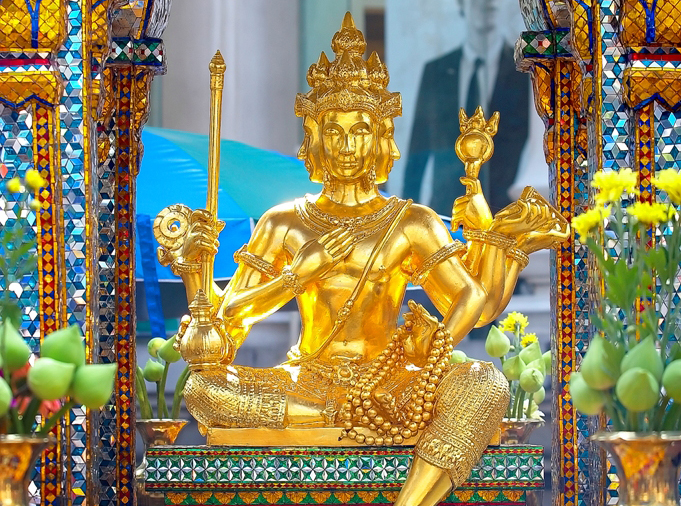 Was Malaysia, a Muslim-majority country with labor shortages, the final destination? If both groups are indeed Uighur, this would mark a new level of southward migration for Uighur refugees. Might this also tie them to Kunming train station attackers, as East by Southeast hypothesized? For now, these are only questions, but ExSE will be searching for answers. In addition to our usual news digest, this week ExSE has compiled a list of articles covering the 3/1 terrorist attack at the Kunming train station. The links are ordered chronologically by publication date, and include both Western media sources and English-language Chinese state media links. Xinjiang Party Secretary Talks Terrorism After Kunming Attack |Diplomat — On Thursday, Xinjiang’s Party Secretary Zhang Chunxian led the Xinjiang delegation’s meeting at the National People’s Congress in Beijing. In the wake of the deadly March 1 attack in Kunming, Zhang faced a barrage of questions about the rise of terrorism within China and the government’s response. The two-faced stance of US on terrorists | China Daily — Many Chinese are indignant at the slow and reluctant response from the United States in condemning last Saturday’s terrorist attack at the railway station in Kunming in southwest China’s Yunnan province. The US’ reluctance to condemn the terrorists is obvious since neither President Barack Obama nor Secretary of State John Kerry has spoken out and deplored the attack. A week later, prayers, paper cranes, heightened security in Kunming | China Daily — According to Zhang Guibai, a member of the armed police in Yunnan, about 6,600 officers have been working on the investigation of the case and maintaining social stability. Police are deployed in and around public places, including parks, schools and train stations. Armed police units also have been strengthened near Yunnan’s borders with neighboring countries. UN human rights body calls for “thorough investigation” over terrorist attack in China | Global Times — The Office of the United Nations High Commissioner for Human Rights (OHCHR) called on Friday for “thorough investigation” over the appalling terrorist attack in Kunming, southwest China, which claimed at least 29 lives and left over a hundred others wounded. Chinese Governor Signals Crackdown on Separatists | NYT — The remarks by the governor of Xinjiang signaled that the Communist Party would tighten security throughout the region in reaction to a knife attack that killed 29 civilians. Chinese police arrest 45 for ‘spreading rumours’ online after knife attack | Guardian — Chinese police have arrested 45 people for “spreading rumours” online in the wake of Saturday’s horrific knife attack at a Chinese train station. China warns influential commentators to stick to party line on Kunming attack | Daily Telegraph — Chinese police have named and threatened some of the country’s most influential journalists and commentators for questioning the party line on a terror attack in Kunming. Terrorist Attacks ‘part of trend’ | Global Times — About 90 percent of violent terrorists use means such as VPNs (Virtual Private Networks) to circumvent the Great Firewall and the increasing amount of terrorist attacks is part of the international trend, the top leader of the Xinjiang Uyghur Autonomous Region said on Thursday. Implications of the Kunming Terrorist Attack | Diplomat — The Diplomat speaks with Dr. Sean Roberts about the implications of the Kunming knife attack. Details slowly emerge in Kunming knifing investigation | GoKunming — As people across China attempt to come to terms with the deadly knife attack on civilians at Kunming’s train station, details of the tragedy are beginning to come to light. Although no clear motive has been announced, high-ranking officials have given statements detailing some actions of the group responsible for the assault. More importantly, many of those injured at the station are reported to be convalescing in local hospitals. Don’t label terrorism as ‘ethnic’: adviser | China Daily — Cases like the deadly attack in Kunming should be handled in a way that avoids linking a terrorist assault with an “ethnic issue”. Zhu Weiqun, head of the committee on ethnic and religious affairs under China’s top political advisory body, made the remark on Wednesday in an interview with China Daily. Chinese Officials Seek to Shift Attention From Rampage | NYT — Days after knife-wielding assailants killed 29 people and injured 143 at the train station in Kunming, Chinese authorities appeared eager to change the subject. Attack prompts strengthened anti-terrorism legislation | China Daily — Legislators and political advisors have proposed improving legislation to counter terrorism following the deadly terrorist attack that killed 29 civilians and injured 143 others. Opposing Narratives in Piecing Together Kunming Attackers’ Motives | NYT — Were the assailants who slashed to death 29 people and wounded 143 others at a train station in southwestern China last Saturday aspiring jihadists or would-be refugees seeking to flee the country? China knife massacre culprits wanted to wage jihad abroad, official says | Guardian — The group behind Saturday’s gruesome knife attack at a Chinese train station turned to violence after failing to leave the country “to participate in jihad”, a senior Communist party official was quoted as saying on Wednesday. Kunming: A New Phase of Terrorism in China | Diplomat — The deadly weekend attack, which killed 29 civilians, could mark a new era for security in China. Kunming knife gang ‘tried to leave China’ before attack | Daily Telegraph — Attackers who launched a brutal mass knifing at a Chinese train station acted in desperation after a failed attempt to leave the country and become jihadists overseas, a Chinese official was Wednesday quoted as saying. Officer tells of fight with terrorists | China Daily –Kunming SWAT team officer Zhang Jun (not his real name) went on his first real crisis response mission on Saturday at Kunming Railway Station and came face to face with a gang of knife-wielding terrorists slashing and stabbing people at random. He was the only member of the four-man team armed with an automatic rifle. Uygur community tries to regain trust after incident | China Daily — Three days after a deadly terrorist attack by eight people from the Xinjiang Uygur autonomous region, the biggest Uygur community in Kunming, Yunnan province, is trying to recover from the shock. In Dashuying, which has the biggest community of Uygurs in Kunming, people from different ethnic groups are trying to build trust. Journalists see bias in Western coverage | China Daily — On Monday, the All-China Journalists Association condemned major Western media outlets, including CNN and AP, for “turning a blind eye” to the terrorist attack at a Kunming railway station, where 29 people were killed and 143 injured. Xi calls for strong ethnic unity to guide nation after rampage | China Daily — Qin Guangrong, Party secretary of Yunnan province and a deputy to the National People’s Congress, said on Tuesday that police tracked the three suspects who fled Kunming to the Honghe Hani and Yi autonomous prefecture in southern Yunnan and arrested them in Shadian, a largely Muslim township in the prefecture, 40 hours after the attack. Qin was the first Yunnan deputy to the NPC to make an official statement on the massacre. 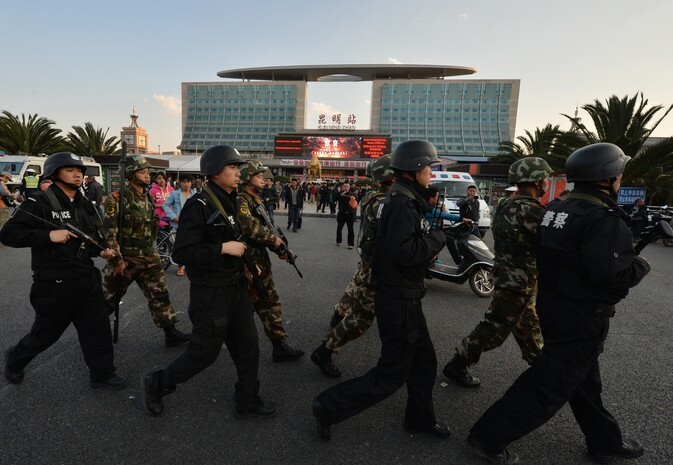 Report: suspects apprehended in Kunming mass stabbing case | GoKunming — Chinese state-run media is reporting all suspects believed to have taken part in a brutal attack on civilians at the Kunming railway station have been arrested or killed. Initial reports put the number of perpetrators at ten or more, but that number has been scaled back to eight. Kunming terrorist attack suspects captured | Xinhua — Chinese police said Monday three suspects involved in the terrorist attack in the southwestern city of Kunming had been captured. The Ministry of Public Security said in a statement that the terrorist gang led by Abdurehim Kurban was responsible for the attack. After Prodding, U.S. State Department Labels Kunming Attack ‘Terrorism’ | NYT — Questioned by reporters, a State Department spokeswoman, Jen Psaki, called the deadly attack in Kunming a terrorist attack, after the Chinese state news media accused overseas news agencies of failing to do so. Train Station Rampage Further Strains Ethnic Relations in China | NYT — Relations have never been easy between the Han majority and Uighurs, but after an attack on Saturday, many Chinese are saying the mood is worsening. Kunming massacre: Has the global jihad reached China? | Daily Telegraph — No terrorist group has claimed responsibility for last Saturday’s attack. But some fear it may be the start of a new cycle of violence as China becomes a target for radicals trained or influenced by Al Qaeda and the Taliban. The state media called the attack “China’s 9-11”: the moment when Islamic terrorists began to target Chinese civilians. Is the Kunming Knife Attack China’s 9-11? | The Diplomat — The deadly attack in Kunming may forever change the way China thinks about and deals with terrorism. 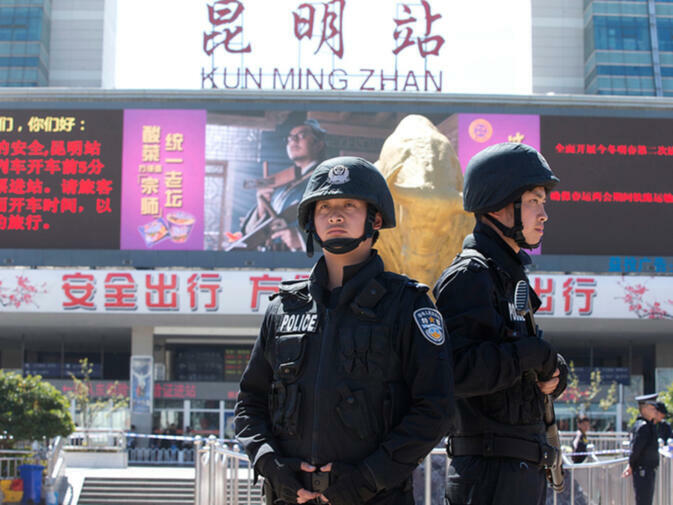 Terror in Kunming | The Economist — Chinese police announced the capture on Monday of three suspected participants in a gruesome attack by a knife-wielding gang that killed 29 people in the main train station of Kunming, a major city in China’s south-west. Security tightened at railway stations, airports in major cities | China Daily — Police in Kunming, Beijing, Shanghai, Guangzhou and other provincial capitals, including Xi’an, Shaanxi province, and Changsha, Hunan province, have stepped up police forces at transport hubs and public areas such as shopping malls and schools, authorities said. Western Media Coverage of Kunming’s Terror Attack Shows Sheer Mendacity and Heartlessness | People’s Daily Online — While China grieved and expressed its outrage following the savage stabbing of innocent civilians by Xinjiang separatists at the crowded railway station in southwest China’s Kunming Saturday night, some Western media organizations, including CNN, Associated Press, the New York Times, and the Washington Post, were already presenting their audiences and their readership with a distorted view of events. US: Train depot attack ‘terrorism’ | China Daily — On Monday, State Department spokeswoman Jen Psaki said the US acknowledged that China has characterized the incident as a terrorist act. Impact of terror attack on Yunnan tourism limited | China Daily — The terrorist attack in southwest China’s Kunming on Saturday has had and will have a limited impact on tourism in Yunnan province, the provincial tourism authority said on Tuesday. Media innuendos unjustified | China Daily — Most media organizations worldwide covered the incident in a professional manner in line with the principle of humanity, however, a handful of Western news organizations have rubbed salt into the wounds, says a Xinhua commentary. Kunming Train Station Attacks: The Media’s Response | East by Southeast — More than a day has passed since Kunmingers and the rest of the world awoke to news of Saturday night’s terrorist attack at the Kunming Railway Station. In that time, local residents, concerned citizens, the media and the world at large have begun the process of digesting what happened and what it all means. Kaiser Kuo: On Radicalization and Chinese Policy | via East by Southeast –While I’ve noted elsewhere how it bothers me profoundly that many Anglophone commentators offer a merely perfunctory nod to the monstrousness of the knife attacks that claimed 29 innocent lives and sent 160 or more people to the hospital with stab and slash wounds before moving on to the “real” issue of Chinese repression of Uyghur rights, I do believe the desire on the part of some people to use the Kunming massacre to talk about underlying issues is well-intentioned and appropriate. Video Said to Be of Kunming Attack Aftermath Appears Online | NYT — Video has emerged on a Chinese video-sharing service that apparently shows scenes from the knife attack in the Kunming train station on Saturday that left at least 29 people dead. U.N. Security Council Condemns ‘Terrorist Attack’ in Kunming | NYT — As the United Nations Security Council condemned the attack in China’s Kunming train station that left at least 29 dead, the authorities moved to delete social media posts that called on leaders to allow open discussion of the situation in Xinjiang, where tensions are running high. China Train Station Attackers May Have Acted ‘in Desperation’ | Radio Free Asia — A group of knife-wielding attackers who went on a weekend slashing spree at a train station in China’s southern Yunnan province may have been disgruntled ethnic minority Uyghur asylum seekers who felt “trapped” between violence in their Xinjiang homeland and the inability to flee across the border into Laos, sources say. Report People From Xinjiang, Police Say After Deadly Attack | NYT — A police station in the southern region of Guangxi has called on citizens to report any people from Xinjiang in their midst, after attackers believed to be from the far western region killed at least 29 people on Saturday. Kunming in the aftermath of the train station attack | GoKunming — n the wake of the attack on the Kunming Train Station, in which official sources say at least 29 people lost their lives and 143 were injured, I went to sniff around the city for stories and reactions. People are stoic, supportive of their fellow citizens and have seemed to steer clear of any racial or religious violence. Kunming restores order after deadly terror attack | China Daily — At the train station where the attacked happened, train arrivals resumed on Sunday after three trains with 3,000 passengers were affected on Saturday night, said station officials. Meanwhile, 60,000 passengers are expected to leave the station on Sunday, higher than the 59,000 on Saturday. China Focus: Legislators, advisors urge US to abandon terrorism double standard | People’s Daily Online — China’s legislators and political advisors have urged Washington to condemn Saturday’s deadly attack in southwest China as terrorist activity after the U.S. downplayed its severity. “The U.S. definition of terrorist activities hinges on its own political interests,” Yin Zhuo, director of the Expert Consultation Committee of the People’s Liberation Army (PLA) Navy, told Xinhua on Monday. Uygur general: PLA backs Xinjiang’s counter-terrorism efforts | People’s Daily Online — The counter-terrorism efforts in northwest China’s Xinjiang Uygur Autonomous Region have the strong backing from the People’s Liberation Army (PLA), said a senior military commander here Monday. “Counter-terrorism arrangements are in place to prevent serious incidents in Xinjiang,” said Saimati Muhammat, major general and deputy commander of the Xinjiang Military Area Command, in an interview with Xinhua. China Blames Xinjiang Separatists for Stabbing Rampage at Train Station | NYT — Although no group has claimed responsibility for the attack, officials on Sunday described the killings as an act of terrorism planned and perpetrated by separatists from Xinjiang, where members of the Uighur minority are increasingly at odds with the government. Attackers With Knives Kill 29 at Chinese Rail Station | NYT — A group of assailants, dressed in black and wielding knives, stormed into a train station in Kunming in southwestern China, slashing employees and commuters. Horrific Knife Attack in China Leaves 33 Dead | Diplomat — Authorities vow justice as a group of men it says are Xinjiang separatists attack a crowd in Kunming. Attack leaves dozens dead at Kunming Train Station | GoKunming — A coordinated assault by at least ten people at the Kunming Train Station has left more than 20 people dead and more than 100 injured. Police reportedly killed four of the attackers and arrested another, while five others remain at large. Foreigners cautious in Kunming | China Daily — Kunming has for many years been a favored destination for foreign travelers, and it has a bubbling expat community. Foreigners in Kunming were shocked by the attack, especially those who witnessed it. Migrants use hookahs to fight terrorists | China Daily — At around 9:30pm, Wang Dezhu, a migrant worker from Baoshan city in Yunnan, and some companions were preparing to take the train to Hebei province when the terrorists attacked. He said the migrant workers wielded bamboo hookahs – long, bamboo water pipes used in rural areas – as a weapon to protect themselves. Social media users condemn attacks, pray for the dead | China Daily — On Sina Weibo, netizens are spreading the word of stopping the circulation of bloody photos on the Internet. At least 29 dead, 130 injured in Kunming violence | China Daily — Twenty-nine civilians were confirmed dead and more than 130 others injured Saturday in a railway station attack in Southwest Chinese city of Kunming, authorities said. Police have shot dead at least four attackers whose identities are yet to be confirmed and are hunting for the rest. It was an organized, premeditated violent terrorist attack, according to the authorities. Deadly Kunming Knife Attack Leaves 33 Dead, 130+ Wounded | East by Southeast — The Spring City’s reputation was irrevocably changed on the evening of Saturday March 1 as a group of five to ten knife-wielding attackers entered the Kunming Railway Station and engaged in a stabbing rampage that killed 28 passengers and wounded more than 100. The Chinese government is labeling the assailants as a Uyghur separatist terrorist group although very little is known of the actual identities of the assailants and their motives. Police confirm injuries in Kunming railway station | China Daily — A group of unidentified armed men on Saturday stormed into a railway station in Kunming, capital of Southwest China’s Yunnan province, causing injuries, said the city police. Casualties have been under investigation, according to the police.